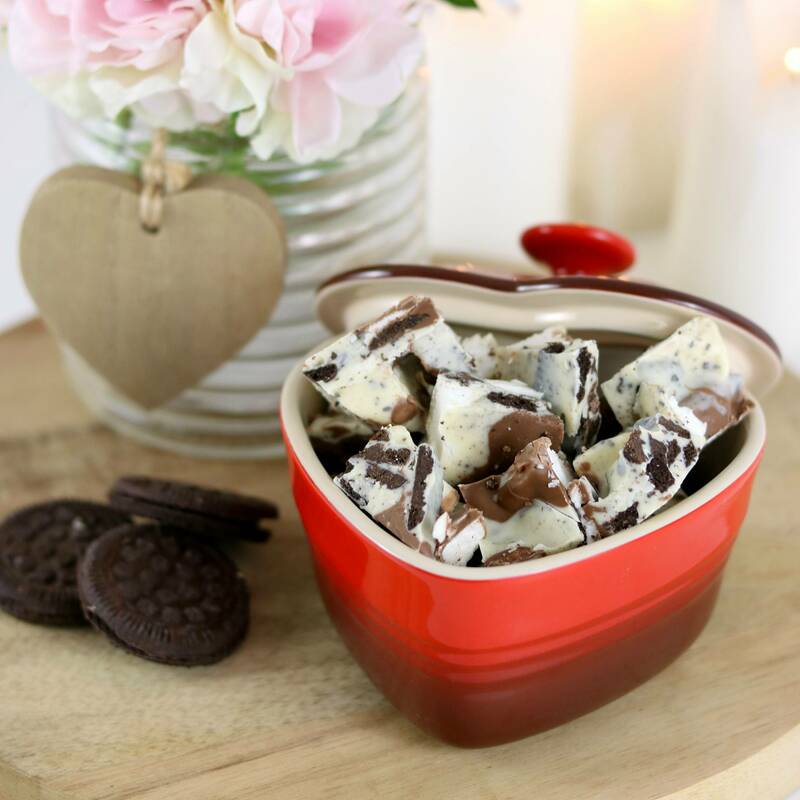 This Cookies and Cream Rocky Road Recipe is easy to make, gluten free and the perfect homemade gift alternative to store-bought candy for Christmas, Easter or Valentine’s Day. White chocolate, milk chocolate and gluten free Oreos combine to make this simple treat. Rocky Road is something we make every Christmas (particularly this Kid Friendly Rocky Road Recipe), but recently, I realised that rocky road shouldn't be something I only make at Christmas time. So, I thought... why not create a rocky road recipe for every holiday? With Valentine's Day fast approaching, I wanted to come up with a simple rocky road recipe that would be the perfect homemade Valentine's gift - and I think I've come up with the perfect one! 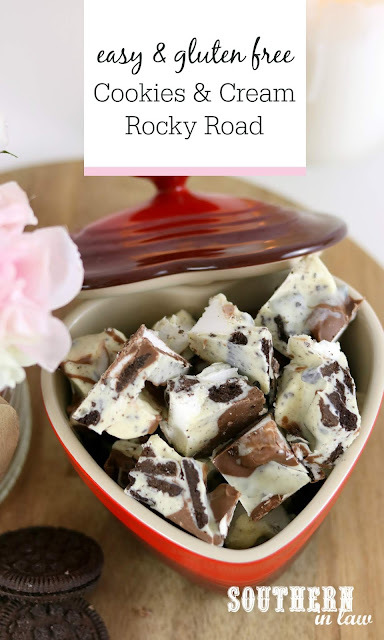 This Cookies and Cream Rocky Road is SO easy to make, and seriously delicious to make... and I'm pretty sure it could make someone fall in love with you. I mean, isn't chocolate the way to most people's hearts? Or is it just Jesse and I who would do anything for chocolate? Best of all? It's one of those homemade treats that can look really impressive - but is actually so simple even the worst cooks could perfect it. Package it up in a box with some cellophane or pop it into a pretty jar and tie it up with some ribbon. It's a simple, easy homemade gift that everyone will love. 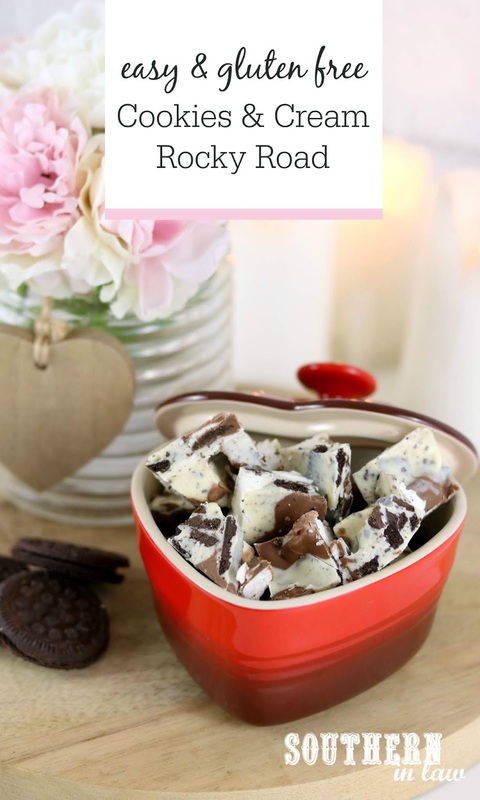 This Cookies and Cream Rocky Road Recipe is easy to make, gluten free and the perfect homemade gift alternative to store-bought candy for Christmas, Easter or Valentine’s Day. White chocolate, milk chocolate and gluten free Oreos combine to make this simple treat. Handmade gift ideas don't get easier than this! Click to pin this post on Pinterest! Line an 8x11" slice tray (or cookie sheet if you don't have one) with baking paper and set aside. Place your milk chocolate and white chocolate in separate heatproof bowls and melt using one of the below techniques. Once your chocolate is melted, add half of your marshmallows and oreos to each bowl and stir to combine. Place alternating spoonfuls of your rocky road mix onto your prepared pan, making sure to form an even layer. Once all of your mix is in the pan, place it into the fridge to chill until set (usually 1-2 hours) before slicing into pieces with a sharp knife. Serve chilled and store in the fridge in an airtight container for up to a month. Place your white chocolate and milk chocolate in two separate microwave safe bowls. Heat your chocolate for 15 second intervals, stirring in-between, until your chocolate is melted. Place your white chocolate and milk chocolate in two separate heatproof bowls. Bring about an inch of water to a simmer in your saucepan. Set the heatproof bowl on top of the pot, making sure the water doesn't touch the bottom of the bowl. Stir frequently, until your chocolate is melted and then remove your chocolate from the heat. Repeat with your second batch of chocolate. * If you're not gluten free, use regular oreos! What's the way to your heart?